If you struggle to generate ideas for new topics on your business blog, you may need to change your approach. Instead of brainstorming dozens of unique topics, focus on one idea, which you can use to create many pieces of content. Your content can also be more than just written blog posts: It can take the form of audio, video, images, or presentations. Here’s a step-by-step guide to help you create more quality content with one topic idea. 1. Start with a broad idea. A broad idea is one you can't fully cover in one piece of content. There’s too much information, and you would need chapters to organize it all. Luckily, in the blogging world those chapters can live as their own, separate blog posts. For example, if you sell products for dog owners, your broad idea can be, “How to Care for a Dog.” There's no way to cover that whole topic in one blog post, and if you tried, each point would be so short it may not be very useful. This kind of broad idea is perfect because it must be split into smaller topics to be covered thoroughly. Once you’ve determined your broad idea, define those smaller topics. 2. Outline your broad idea. Create an outline as if you were going to write a book with multiple chapters on your topic. If your topic is broad enough, parts of your outline may branch into standalone ones. You may come up with parallel ideas that could be their own broad topics for a future series of posts. Flesh out these topics with more specific points under each main section. When you look at the subtopics above, you may be able to think of more bullet points to add to each section. In this instance, you could cover the same broad topic with different pets, and you would have dozens of parallel outlines that are animal specific. Once you’ve written your outline, you’ll see how many unique topical pieces you can develop from one single broad idea. 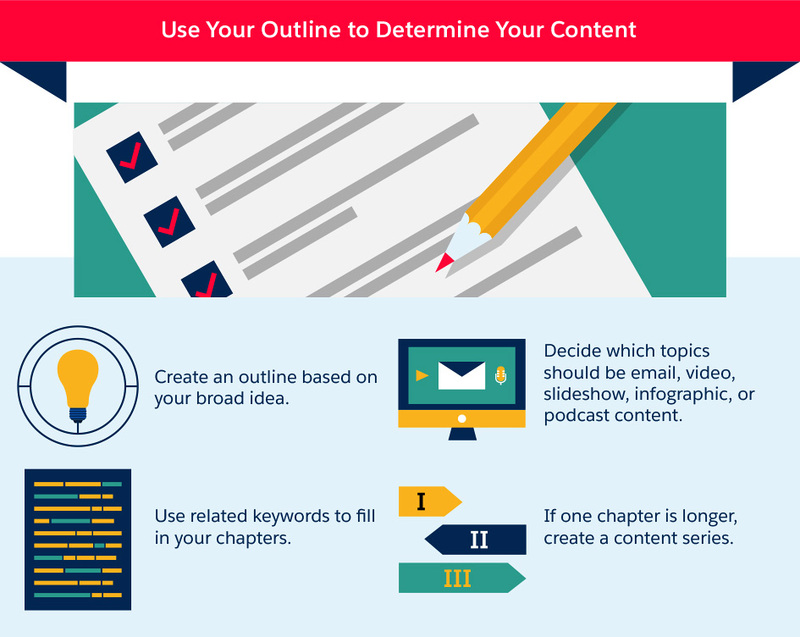 Each section of your outline—plus the related variations—can serve as a new piece of content. 3. Research keywords for your broad idea. Further expand your outline with keyword research. In Google AdWords Keyword Planner, enter your broad idea. This tool allows you to browse related ideas in category groupings. Click on each hyperlinked keyword grouping to find specific keyword phrases that relate to your broad idea. Each will be displayed with its estimated monthly search volume, competition, a link to the keyword phrase's monthly search trend, and estimated cost if you were to pay for AdWords using that keyword phrase. Alternatively, click the Keyword Ideas tab and download all of the suggested keyword phrases related to your broad idea. Many are similar, but this is an excellent way to come up with even more topics for your blog posts and other content. Another advantage of this method, aside from making Google brainstorm ideas for you, is you will see the estimated monthly search volume for each keyword phrase. This information can help you choose which topics to write about first to build your content library with articles people search for and want to read. Ubersuggest is another great keyword tool. When you start typing a particular phrase into the search box it displays Google suggestions to finish your thought. Type in variations of your broad idea to see more specific topics you can use for multiple pieces of content. As you browse through the lists, you’ll likely see keywords you can add to your outline. You may also see results you want to enter back into Ubersuggest to generate even more topic ideas. 4. Create many pieces of content. Once you organize the specific topic ideas you generated from your broad idea, the next step is to create your content. Remember: You do not have to limit yourself to content for your blog. As you look through your outline, consider which topics would work well as other forms of content, especially on social media channels. 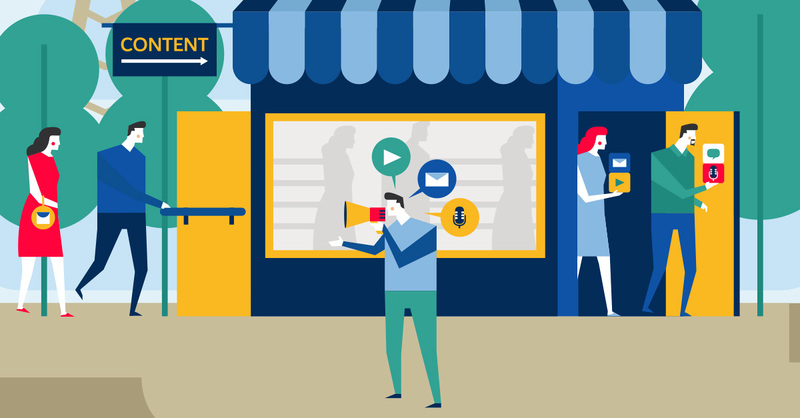 Consider repurposing your content into an email, video, slideshow, infographic, or podcast series. This approach allows you to create unique, varied content from one broad idea. People like to consume content in different formats. By publishing content on a number of platforms you’ll cast a wider net and can reach your ideal audience more effectively. In addition to multiple pieces of content in multiple formats, you can promote each to new audiences. People on YouTube, SlideShare, Pinterest, and iTunes will be exposed to your content and, most importantly, learn about your business. After you publish your content, you want to make sure people can find it. If it’s in multiple formats, create libraries on your website for different categories, such as a videos, podcasts, or infographics. Some blogs have links to pages devoted to their infographics, marketing guides, webinars, and other differentiated content to organize them for readers. If your content is a series of blog posts, create a page that serves as a table of contents and lists each blog post in that particular series. While tags are a great way to organize posts, you don’t want to force people to click on a tag and scroll all the way back to the beginning. Make it easier to read similar posts by organizing them on one page. Similarly, you can list several types of content organized around a central theme on one page. One such example is a Getting Started page. This page can direct visitors to different types of content that are ideal for someone who’s unfamiliar with your business: a link to a report, relevant podcasts, a welcome video hosted on YouTube, introductory posts on your blog, a page with an infographic about your company, and a number of resources. If you created enough written content on one subject to produce a cohesive whitepaper or book, consider compiling all the posts, formatting the content into book form, and publishing it as a standalone piece. Make it available to people with e-readers by offering it as a download in different online libraries to attract new audiences to your business. Or use it as a free e-book giveaway for subscribers to your email list. You can also use features offered by specific networks to organize your content. SlideShare automatically organizes your uploaded content into presentations, documents, and infographics. YouTube offers playlists that group your videos into ordered lists by topic. Pinterest offers boards to organize your images by topic. Use your social media channels to communicate with your audiences and organize your content. In doing so, you’ll also promote your content to a new audience. When you publish content without promoting it, you miss out on a host of opportunities to advertise your content, related content, and your company. 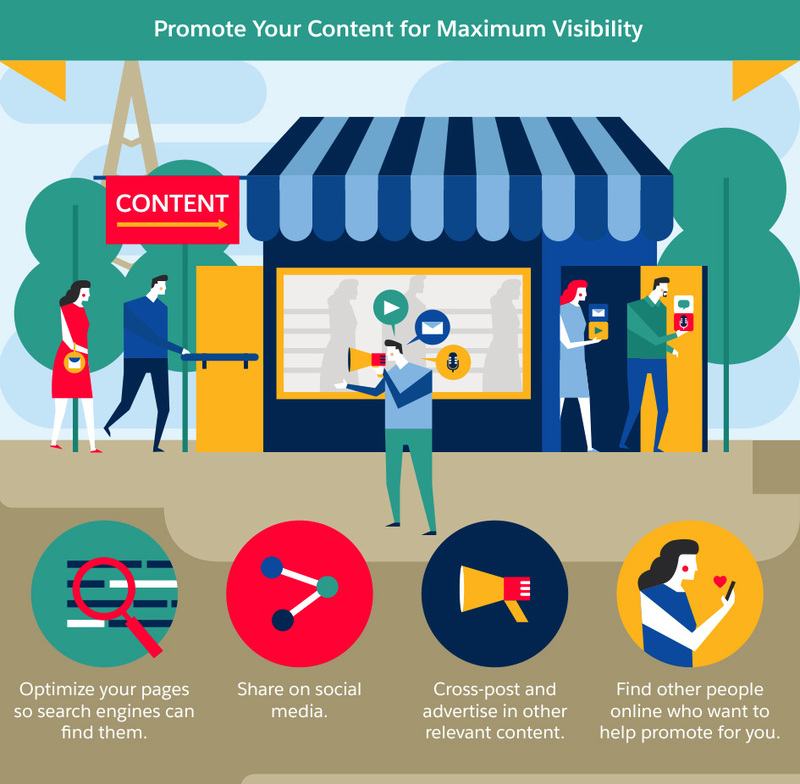 Promote your content so more people can find it. First, make sure you optimize. Use basic search engine optimization on your content library pages so people can discover the series. Just as important, optimize each piece of content you created for search engines. This includes on-site content such as blog posts and off-site content like videos. All forms of content can be optimized for search engines by including the main keyword phrase within the title of the content on YouTube, SlideShare, iTunes, and other popular social media sites. Share your content on any site where you have a presence. You can share it as a series or as individual pieces. Consider social media advertising to boost your reach within your target audience, especially if you offer your content as a way to get people on your email lists. Distribute video content to your Facebook page, since Facebook videos get more organic reach than other types of content. When it’s relevant, crosspost your content. If you have a SlideShare presentation, video, or infographic that goes well with a particular blog post, include it in the blog post. Pin your content, especially infographics and visual materials, on Pinterest. Images and videos are pinnable, and those pins have the potential to drive massive traffic back to your website. As you get to know your social media audiences, you’ll learn how to best promote your content on those channels to maximize engagement. Finally, look for bloggers who link to specific types of content and ask if they would link to your content. Do so only after thoroughly researching the blogger. You want to know which content would appeal the most to both the writer and the audience of a blog. Some people like to link to great podcasts on a topic, while others like to link to great videos. Make sure to learn about the blog before you ask—does your business want to be associated with a specific blog’s audience? Next time you feel you’ve run out of ideas for your company’s blog, give this method a shot. Creating a series of content from one broad idea is beneficial in many ways, especially because it helps generate multiple, related topics. Then, when you turn your multiple content ideas into different formats, you'll have the chance to reach larger audiences. Content creation based on a general, overarching theme can be a win for your content marketing strategy.